“No Charges Filed Against Off-Duty LAPD Officer,” the headline reads. A video shows a grown white man bearing a gun, clutching the shirt of a child. Another grown white man stands away with his hands in his pockets, while children rush to support the child, who is being dragged by the hands of the grown white man. In the news, the perpetrator’s name is concealed to protect his identity. As he walks free, two children are detained in the Orange County Juvenile Hall. To talk about recognition and intelligibility under liberalism means engaging with the present. In our Introduction to Latin American and Caribbean Studies II seminar this week, Nara Milanich was invited to speak to our class on the topic of law, filial relations and the production of social inequalities in late nineteenth century Chile. In Children of Fate: Childhood, Class, and the State in Chile, 1850-1930, Milanich traces the paradoxes of liberalism and the ways in which transformations in civil law regarding the family actually re-instated social inequalities. Here, continuity with longstanding social practices rather than rupture, marks the trajectory of the liberal state. One example is the increasing secularization and growth of state power matched by a contradictory emphasis on private rights and personal freedom. Another more pointed example is the function of judicial authorities who characterized children as “too young to ‘determine the use of his person,’” yet acknowledged their self-determination. Milanich, N. B. (2009). Children of fate: Childhood, class, and the state in Chile, 1850-1930. Durham: Duke University Press, 123. 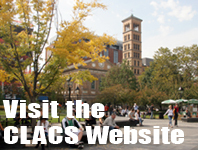 CLACS wants to thank all those who attended our 50th Anniversary Inaugural Reception and book talk that celebrated the contributions of Latin Americanist and founding CLACS Director Dr. Kalman Silvert. Silvert’s family and scholars scholars including Jorge Balán, Abraham F. Lowenthal, Chris Mitchell, Martin Weinstein were among those who joined us in the celebration. The panelists presented the book “Kalman Silvert: Engaging Latin America, Building Democracy” and outlined Silvert’s legacy as a father, mentor, Latin Americanist and interdisciplinary scholar. You can see the broadcast of the book presentation on our CLACS NYU Youtube page or watch the video below! Thank you again for joining us and please be sure to check out more of our events and celebrations of our 50th Anniversary by visiting our events page. On December 3rd and 4th, CLACS will host “wüne adngen/la imagen antes de la imagen: A Showcase of Indigenous Films from Chile.” This one of a kind event, aims at promoting a discussion on the state of the past, present, and future of the indigenous peoples of Chile. It will feature six shorts, from fiction to documentary, and conversations with renowned Mapuche filmmaker Francisco Huichaqueo, and the Director of the new Indigenous Peoples Unit of the Cultural Council of the Ministry of Culture of Chile, José Ancan. 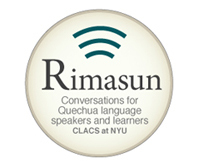 This event is co-sponsored with the Embassy of Chile, and Hemispheric Institute at NYU. A conversation with film director Francisco Huichaqueo, moderated by Amalia Cordova will follow the screenings. This conversation will be conducted in Spanish. Ignacio Acebo Wañuma baja-Sucremanta, Mario Agredataq Tikirpaya-Cochabambamanta. Paykuna ayllukunankupi raymikunamanta willariwanchik. Ignaciop ayllunpiqa iskay jatun raymikuna raymichakun, jukninqa rupha mit’api “Carnaval” juknintaq chiri mit’api “Tata Santiago” Carnavalpiqa tukuy runakuna pachamamaman, wak’akunaman q’uwanku ch’allaykurinku ima ñin. Chantapis achkha mikhunata wakichinku, tukuy mikhuntutaq tusunkutaq. Chiri mit’api raymitaq rikhuriq tata Santiagop sutinpi ruwakun. Achkha tusuqkuna may sumaqta tusunku. Mariop llaqtanpitaq kimsa lata raymikuna raymichakunku: Carnaval, Todos Santos, Chanta Rosario virgen ñisqa ima. Carnaval raymiqa Ignaciop ayllunpijina. Rosasio Virgen ñisqa raymipitaq runaqa pukllayta munan, waka tinku pukllay tiyan, chanta rurasnuwan, tunaswan warak’anakupis tiyallantaq. Todos Santos raymipiqa, machu runapaq wallunk’añataq maychhika, takipayanaku chanta unay kawsay yachaykuna ima apaykachakun. Ignacio Acebo de la ciudad de Wañuma baja-Sucre, y Mario Agreda de Tikirpaya-Cochabamba nos cuentan sobre las fiestas tradicionales de sus pueblos. En la comunidad de Ignacio se celebran dos fiestas grandes, una en verano “Los carnavales” y la otra en el invierno la fiesta del “Señor de Santiago”. Durante la fiesta del Carnaval la gente ofrenda a la Madre Tierra y a los lugares sagrados como montañas, wak’as. Preparan mucha comida, toda la gente baila y come. La fiesta durante el invierno se celebra en honor al Santo que apareció en el lugar, diferentes grupos de danzarines hacen su paso. En la comunidad de Mario se celebran tres fiestas: el Carnaval, todos santos y la virgen del rosario. Los carnavales son similares al igual que en la comunidad de Ignacio, pero durante la fiesta de la Virgen del Rosario, la gente busca diferentes espacios de diversión, hay juegos con toros, juegos con ondas donde la gente se lanza duraznos, tunas. En la fiesta de todos santos abundan los tradicionales columpios para adultos con canciones típicas de la época y diversidad de costumbres. 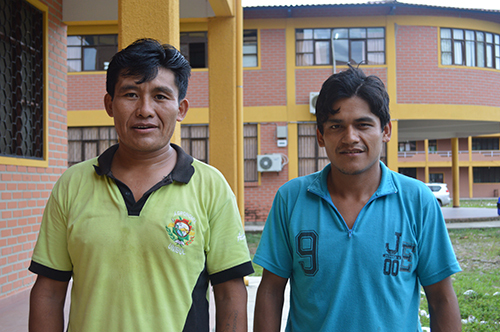 Ignacio Acebo is from Wañuma baja-Sucre and Mario Agreda is from Tikirpaya-Cochabamba. They tell us about the traditional festivities in their small communities. In the community of Ignacio two big festivities are celebrated, one during the summer, “Carnaval” and the other during winter, “Señor de Santiago”. During Carnaval people make offerings to mother earth and the sacred places like mountains, and wak’as (sacred monuments or objects). People gather to celebrate by preparing food, eating, and dancing. The party during the winter is celebrated in honor of Saint Santiago. This also a major festival in which various dance groups perform in the parades or parties. In the community of Mario three festivities are celebrated: the Carnaval, Todos Santos, and the “Virgen del Rosario”. Carnavales are similar to what happens in Ignacio’s community, but during the “Virgen del Rosario” people look for amusement such as bullfights, and games where people throw peaches and a fruit called ‘tuna’. In “Todos Santos” a wealth of activities take place ranging from the adults singing classic songs from their generation to playing on old-fashioned swings.